The infamous “jogger’s heel“ or Plantar fasciitis is a disorder characterized by a sharp, stabbing pain in the heel and arch of the foot, experienced by approximately 10 percent of regular runners, though other athletes and non-athletes (overweight people, most prominently, because their excess weight puts some additional pressure on the feet) are also under risk of developing this injury. 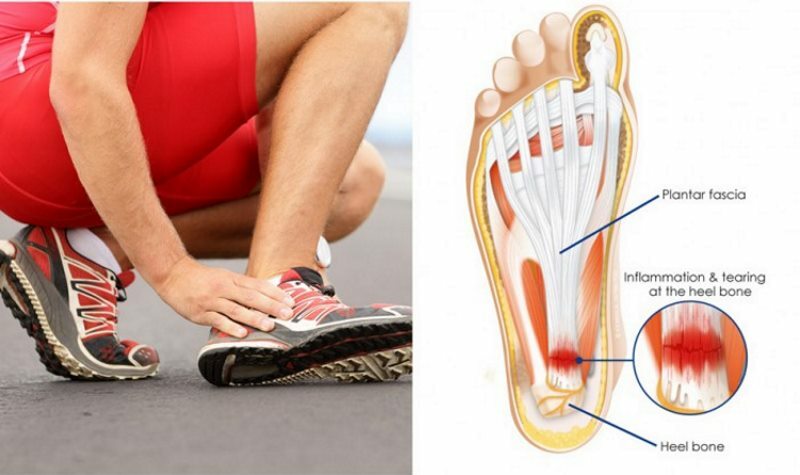 Most of the pain is felt at the bottom of the heel and usually is the worst at the first step in the morning but can also occur during or after a run or a long period of standing. The suffix “itis“ indicates inflammation, which in this case targets the fascia, a thick band of connective tissue that runs from the heel bone to the base of the toes. This fibrous tissue maintains the arch of the foot, pretty much like a bowstring pulled between the heel and toes. If tension on that bowstring becomes too great, it can cause a tearing of the fascia – if the tearing is repeated, it will lead to inflammation. The disorder is most common in people with high foot arches or people with extremely flat feet because those two type of feet place the greatest stress on the fascia during any physical activity. But no matter your foot type, the regular performing of activities that place a lot of stress on the heel such as long-distance running and ballet dancing can easily lead to this condition. In addition, people with professions that require long periods of standing and people who often wear shoes with inadequate support are at high risk of plantar fasciitis as well. 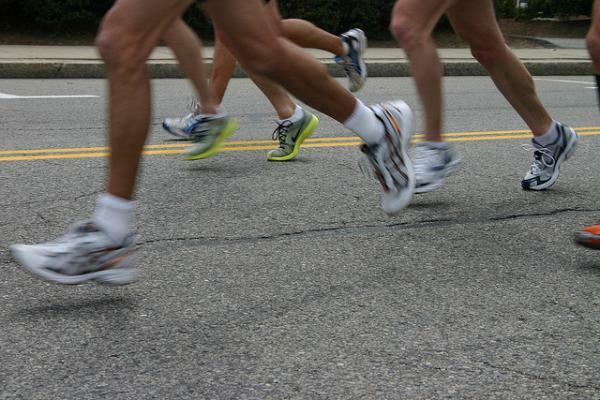 How to treat plantar fasciitis a.k.a jogger’s heel? This condition requires immediate treatment, because ignoring it can result in chronic pain that will interfere with your daily activities and possibly lead to pain in the knees, hips or back and the development of serious injuries. If you are experiencing heel pain, make sure to consult your doctor before taking matters in your own hands. Fortunately, there are many ways to treat plantar fasciitis. But first of all, consider giving your feet some quality rest and cut back on activities that cause you pain. Sometimes, athletes tend to ignore the pain and proceed with regular routine, which will only make things worse. You can try to strengthen your fascia by doing toe stretches, calf stretches and towel stretches three to four times a day. Also, stretching good before you start walking can help soothe the pain in the morning – sitting up in bed, hold onto your flexed feet and gently pull them toward you until you get a good stretch in the Achilles tendons and calves, hold it for 30 seconds then relax and repeat it a few more times. Furthermore, buy new shoes with good arch support or quality shoe orthotics that will balance out the pressure placed on your feet. Finally, incorporate more zinc and magnesium in your diet for their powerful regenerative properties. – While over-the-counter anti-inflammatory medications can provide some relief, one of the most effective treatments available is the R.I.C.E treatment (Rest, Ice, Compression, Elevation). In other words, the first thing to do when you feel pain is to take a few days off and give your foot time to heal and recover. Then, freeze water in a paper cup and roll the ice over the painful area for a few minutes. After that, wrap the foot in a bandage for compression. And finally, place the wrapped foot on a chair or table in an elevated position, lie on your back and relax for ten minutes. The elevation will reduce any welling. Repeat the whole procedures at least two times a day for best results. Research has shown that this treatment gave the best results in almost 25% of patients. – Natural remedies can be also effective for the treatment of plantar fasciitis – try salt and honey compresses or potato wraps. For the first one, mix equal amounts of salt and honey and apply the mixture on the painful area, then fixate it with gauze and a plaster. Bandage the feet with a nylon bag and let the remedy do its thing during the night. Repeat for a few days. For the latter method, wash a few potatoes, slice them unpeeled, put them on a gauze and wrap it with some cellophane around the foot. Change the wraps regularly and repeat the procedure for a week. Another option is to cut a raw potato on slices and put them in a cotton sock, right under the foot. Alternatively, the black radish can provide similar relieving effects for pain and swelling – put slices of black radish in your socks and leave them there during the night. In the morning, wash the feet with warm water. Repeat for a few days. There are plenty of traditional folk remedies for this condition and you can easily choose the one that suits you best. We hope that you take the pain seriously and do everything you can to protect your feet from further damage – maintaining good health is the ultimate precursor to being fit!